The 2016 Christmas Express is the 5th year hosting this family fun event to support the non-profit organization. 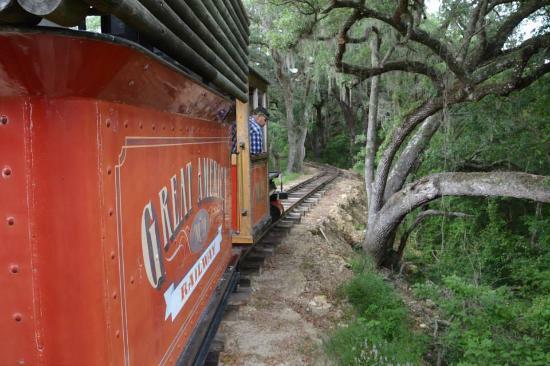 Experience the #1 Christmas Train in Florida! You’ll get to see Christmas lights like you’ve never seen before as you take the 20-minute journey around the Kirby Family Farm property on our authentic, narrow-gauge historic locomotive. But The Christmas Train is so much more than a train ride! The Christmas Express is a wonderful holiday event that runs on select nights in November and December. There are many activities to see and do, and we recommend at least 2-3 hours for the entire Christmas Express experience. -Optional activities are available by obtaining an all-inclusive Golden ticket unlimited wristband (includes ALL basic and optional activities). -The NEW for 2016 Indoor Christmas Buddies Maze. Your family or group can visit with Santa, then wander through the maze and meet Rudolph, Frosty, The Christmas Princess, and more! -There are also fun amusement rides offered with the Golden Ticket including the Monster Bus ride, Hayride, Tin Lizzie Cars, and others amusement rides. There are always at least 8 additional activities available to enjoy with a Golden Ticket. A full list of optional activities will be available as the event dates approach.